The Baltic 38 is an attractive, capable, well designed and constructed blue water performance yacht. 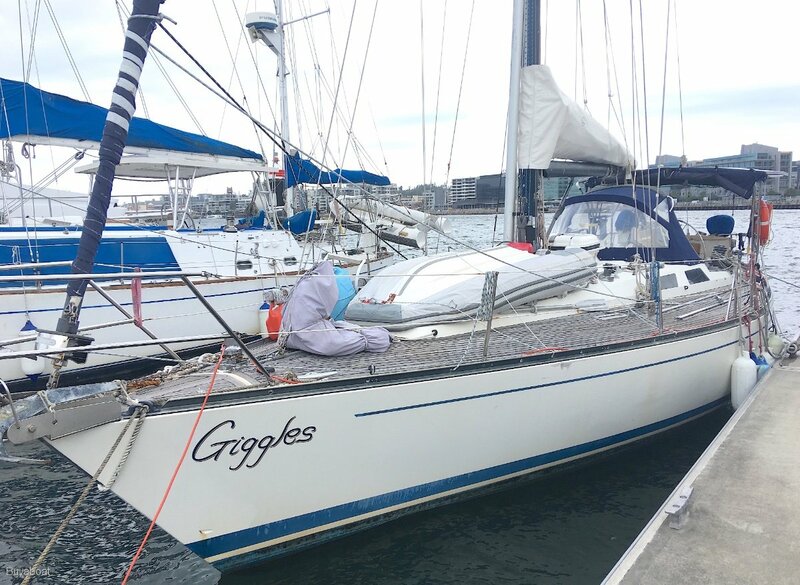 Built at the Baltic Yachts yard in Finland and launched in 1984,"Giggles" once participated in and won the TRANSPAC single handed race from Los Angeles to Hawaii. She has also cruised extensively around the world and up and down the east coast of Australia in recent years. She is a capable, safe, offshore boat with a large inventory suited to passage making and extended liveaboard cruising. Below decks, accommodations are comfortable and practical, with all the systems required for extended periods away from civilisation. Up on deck, a real offshore boat that is well rigged and set up for short handed sailing. If you are looking for a seaworthy, well found vessel that has been set up and is ready to go, have a look at "Giggles". A rare boat in our waters that has the runs on the board. Fin keel through bolted to hull. Lead. Ballast weight 2950kg. Two stainless steel sinks with hot and cold mixer. Salt water foot pump and fresh water foot pumps. Fridge/freezer, Oven and plenty of cupboard space. Heat exchange from diesel heater and engine. Double V berth forward with ample storage space available. Large double berth cabin aft with plenty of opening portals for ventilation and ample storage space. Dining table and bench converts to double (or 2x single berths in saloon). New windows. New electric toilet in enclosed head. High density poly holding tank. 2x large Rocna (22kg and 15kg) mounted side by side on substantial SS stem head bow roller. Anchor 1 has 100m x 10mm galvanised chain in anchor locker. Just been antifouled in March, A great boat. For more information, please call Glenn at Buyaboat on 0414 988 273.